It’s been a long time since we’ve seen any new Zoo Lunchies designs, but just in time for back-to-school, Skip Hop has added four adorable new characters to their growing pastel zoo – a sweet kitty,a ferocious dino, a fun-loving hippo and a darling giraffe! Like all Zoo Lunchies Lunch Bags, both kitty and giraffe feature a roomy main compartment for your child’s lunch that holds sandwiches, snacks, drinks and more along with an insulated, wipe-clean interior to keep food and drinks fresh and cold. There’s also an interior mesh pocket for holding lunch money, an ice pack or utensils and a write-on name tag. A top handle clasp allows you to clip this lunch bag easily to other Skip Hop products, like their cute backpacks. Each lunch bag has a super neat coordinating pull tab on the zipper and the whole deal is BPA and phthalate-free. It's been a long time since we've seen any new Zoo Lunchies designs, but just in time for back-to-school, Skip Hop has added four adorable new characters to their growing pastel zoo - a sweet kitty,a ferocious�dino, a fun-loving hippo and a darling giraffe! 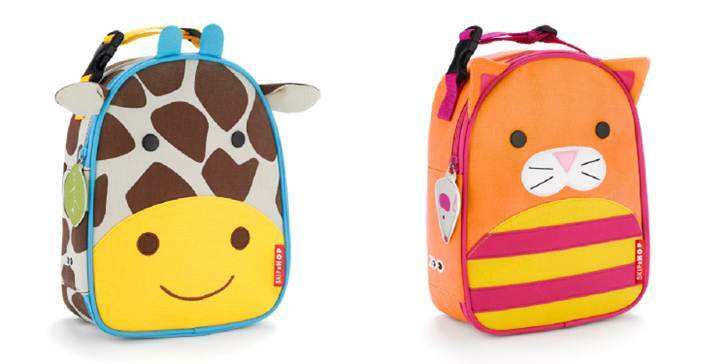 Like all�Zoo Lunchies Lunch Bags, both kitty and giraffe feature a roomy main compartment for your child's lunch that holds�sandwiches, snacks, drinks and more along with an insulated, wipe-clean interior to keep food and drinks fresh and cold. There's also an interior mesh pocket for holding lunch money, an ice pack or utensils and a write-on name tag. A top handle clasp allows you to clip this lunch bag easily to other Skip Hop products, like their cute backpacks. Each lunch bag has a super neat coordinating pull tab on the zipper and the whole deal is�BPA and phthalate-free.